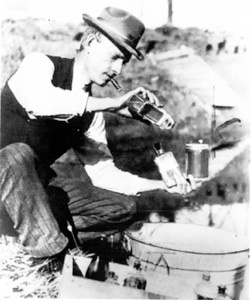 Charles M. Hatfield, whose life was the inspiration for the play and motion picture “The Rainmaker”, was a folk hero who claimed that he successfully made it rain more than 500 times in parched towns around the world. His rainmaking abilities nearly destroyed San Diego County in 1916 during a days-long torrential downpour and flood that claimed 20 lives; washed out homes, farms, roads, bridges, and railroad tracks; and resulted in the collapse of a darn at Otay Lake. In Valley Center, an avalanche of water isolated the entire community, forcing food and supplies to be shipped by barge from Oceanside for two months. From his home in Valley Center, where he lived with his wife Mabelle, Hatfield the Rainmaker — as he was widely known — would concoct a brew of 23 chemicals which vaporized into the air after being released from a cauldron set atop a 20-foot tower. He employed a similar technique at other sites. 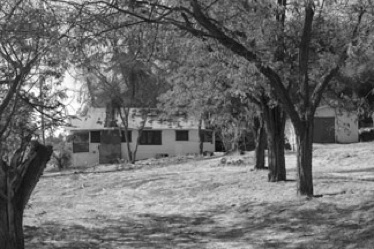 Hatfield grew up east of Oceanside on his father’s farm where he first experimented with pluviculture, the craft of rainmaking. His initial success at producing a drizzle prompted him to develop his skills at rainmaking at which he worked for three decades into the 1940’s. He died in 1958 at the age of 82. The famed rainmaker took his secret formula to the grave. Hatfield’s life inspired a play (1954) and movie (1956) titled “The Rainmaker”. A Broadway musical (1963) was called “110 in the Shade”. The New York City Opera produced a version of the musical (1992). All portrayed him as a con-man. In 2007, there was a Broadway revival of the musical and the publication of a novel, “Storm Runners”. All were fictional accounts of Hatfield’s life. In April 2013, the buildings at this site were demolished. Sources: archives at the Valley Center Historical Society (Clyde James Memoirs, 1890-1973); interviews by Gray Wilshin, Sterling Dorman and Gail Lamb (1981); oral interview with Hatfield by Edgar Hastings, 1956-57 (magnetic tape on file at SDHS); newspaper accounts.